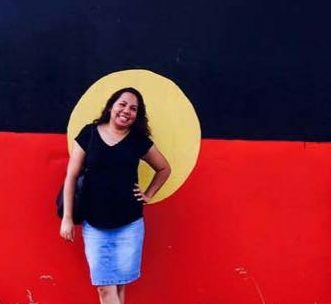 Emma Stubbs lives in Alice Springs with her husband and two children. She was born in Port Augusta and relocated with her family to Amata (which is part of the APY Lands, in Northern South Australia) as a young girl. In Amata, Emma was exposed to the traditional stories and ways of the Yankyatjara people of the area. She was taken across the lands and taught the language and ways of the women from these lands. It was while here that Emma would watch her Grandmothers painting their artworks while singing and telling the traditional stories behind the paintings. She has always remembered this time in her life as a happy and peaceful time. Emma has been painting her works for 20 years and only recently decided to try exhibiting these beautiful depictions of her country in galleries. Yubu Napa is thrilled to be able to exhibit Emma’s contemporary paintings in their gallery in Alice Springs.